8 SHAPED WALKING EXERCISE MAT for weight loss costs 4500 rs. 8 Shaped walking is 4 times more beneficial than a straight walking. Most suitable for ladies and gents who cannot go out for walking. thanks to the wisdom of our Yogis & Siddhas of Ancient India. 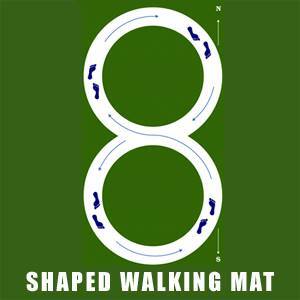 It is 8 Shaped Walking Exercise Mat. Walking over this 8 shaped Mat in the shape of 8 for 15/30 minutes in the morning and evening is said to shower atleast 4 times more health benefits than a normal straight walking, when the organs are less impacted. Whereas when you walk in the shape of 8, turning to your left and right putting your entire body weight on one side, the organs on both sides of the body and abdomen are greatly impacted resulting in amazing health benefits, few of which are listed below. Brisk walking need not be done over this mat. Slow walking itself is enough. 8 shaped walking over this Mat, very effectively addresses problems related to Insomnia, nose blocks, Sinus, Asthma, Head ache, Migraine, Thyroid, OBESITY, Unwanted Fat, Knee pain, Rheumatoid Arthritis, Constipation, Neck, back, lumbar, Spondylitis, Depression, Nervous debility, SUGAR LEVELS, BLOOD PRESSURE, Heart Problems and many more health imbalances. Besides, this Mat is Scalar Energized, which helps to keep the body in the most desirable earth frequency when walking over this Mat. The Mat measures 10 ft x 5 ft and is spread on the floor, inside the house or in open. It is ideal to have this Mat spread in the Bedroom or Drawing room/Hall itself, so that it reminds you all the time and you don’t miss out your walking. As you are talking on your mobile for about 20 minutes, you can walk on this mat and unknowingly cover 1-2 Kms of walking! When you walk 110 times in this Mat , it is equivalent to about 1 KM of walking.